Another good choice among half-ton pickup trucks is the Ram 1500. This model is faced with stiff competition which comes from top-selling Ford F-150, GMC Sierra, Chevy Silverado and other contenders are Nissan Titan and Toyota Tundra. Almost all of its main rivals has been thoroughly overhauled and redesigned in recent model years and they have steeped in the new generations but Ram 1500 was officially redesigned for the 2009 model year. The next significant refresh came in 2013 year but however in the current form the Ram 1500 is almost all-new truck which however features slightly updated exterior design. This model includes class-unique coil-spring rear suspension which provides smother ride over bumps and tough terrains than widely-used leaf-spring setup and also offers air-suspension alternative. Over the years since the last redesign model has also introduced slightly lighter body construction and new reinforced frame, but also new automatic transmission, upgraded interior, and modernized infotainment system and other technology features. Another important upgrade for this model was a new V-6 turbo diesel engine which came in 2014 model which has made the Ram the most fuel-efficient in its class. The 2015 model year passed with introduction of some new options packages while 2016 model has brought new color options, some top trims modifications and better crash protection. 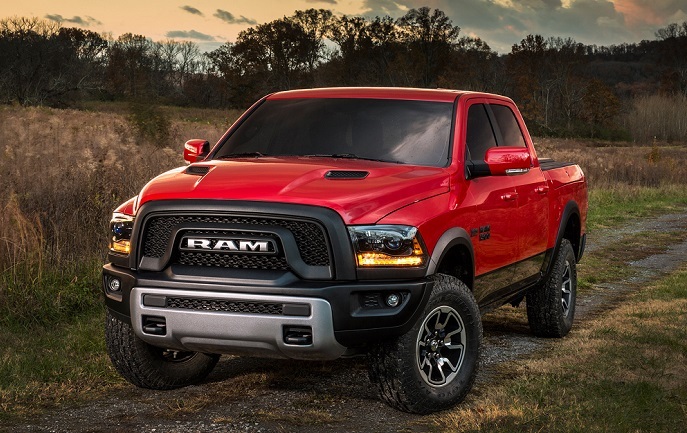 As for the 2017 Ram 1500, the company hasn’t announced big changes. The model is still strong seller and more substantial changes will likely be introduced for 2018 model year. The mechanics of the 2017 Ram 1500 will be mostly carried over from the current model. The most trims will be standard with a 3.6 liter V-6 engine which should stay around current 305 hp and 269 pound-feet of torque. This engine is coupled with an eight-speed automatic transmission which includes rotary knob placed on the instrument panel. The model is standard with rear-wheel drive while two four-wheel drive layouts are also available. One is manually selectable part-time all-wheel drive system and the other four-wheel drive automatically delivers power front to rear depending on the traction. The fuel economy of this powertrain is expected to stay around 20 mpg combined in all configurations. For those who need more power and towing ability and don’t care about fuel economy more powerful a 5.7 HEMI V-8 will be available. It will be capable to produce around 400 hp while torque will max around 410 lb-ft. It can be combined with a six-speed automatic and eight-speed auto gearbox. Combined with less-gears transmission it will return around 15 mpg combined while eight-speed V-8 powertain should improve fuel economy on 18 mpg combined. If you value fuel economy the most but also need good towing capability you should pick the 3.0 liter turbodiesel V-6 engine. It will be exclusively available with an eight-speed transmission. This combination will make around 240 hp and peak torque of 420 lb-ft. The fuel efficiently of this powertain will vary around 24 mpg depending on the configuration. The V-6 gas powered Rams will allow around 7,600 pounds of towing while V-6 diesel powertrain will rise max towing to around 9,300 pounds. The towing leader V-8 HEMI powered Rams will be around 10, 700 pounds. The Ram 1500 will also deliver good ride and handling thanks to the independent front suspension and coil-spring setup on the rear. However, it will also offer air damped rear suspension as option which will allow the ride height to be configured in five heights. This model will also include electric steering. The 2017 Ram 1500 will showcase very similar design which has been present since its last redesign in 2009 model year. However, it will look distinctive and every trim will be accentuated with black, body-colored or chrome inserts. Almost all trims will also get unique grilles and since last model year the Rebel and Laramie Limited models are with new grille style which doesn’t use crosshair design and instead features one curved slat and Ram nameplate replaces Ram’s logo. On the other hand, the lighting clusters will be slightly restyled and modernized and new color options will be available. Interiors of the new Ram 1500 models will be comparably larger and more comfortable than on the most of its main rivals. Of course the interior space will depend on cab style but however the space will be neatly used and will offer clever storage compartments. The Ram will get a lot of attention to material quality and finishes and it will also include well-arranged dashboard. The controls and buttons on dash are easy to use. The infotainment system will be upgraded and intuitive and will cover smartphone integration, voice controls, WiFi hot spot and much more. The base versions will come with bench seats while optional bucket seats are soft and comfortable and with power functionality in higher trims. The crew cab models will offer more rear seat leg room. As for trim options and available features, this half-ton truck will be offered in wide range of configurations which will suit all needs of potential buyers. Three cab styles including Regular Cab, Quad Cab and Crew Cab versions will be available. Models will come with three bed length including 5 feet 7 inches, 6 feet 4 inches and 8 feet. The trim lineup will probably remain similarly arranged which means 11 available grades. The company hasn’t reveled full specification and list of features in each trim. Some, equipment regrouping and juggling is expected and more precise listing will be available closer to model’s release date. However, we should expect everything from basic equipped Tradesman models with vinyl upholstery, bench seats and basic electronics to luxury appointed higher trims which include leather trimmed interiors, heated seats, wood and metallic accents, navigation and much more. The Ram also boasts one of the most user-friendly infotainment systems in its class. The UConnect system is responsive and easy to use and offer modern compatibility options and many other features. Where Ram should advance is the safety and here we could expect to offer some new advanced options in order to follow the leading models. The 2017 Ram 1500 will certainly remain one of the best choices in full-size pickup class despite big changes are not expected for this model in upcoming model year. That also means that price will also stay close to the current boundaries. As for the release date, the company hasn’t revealed its intentions but model will probably be launched during the second half of this year.